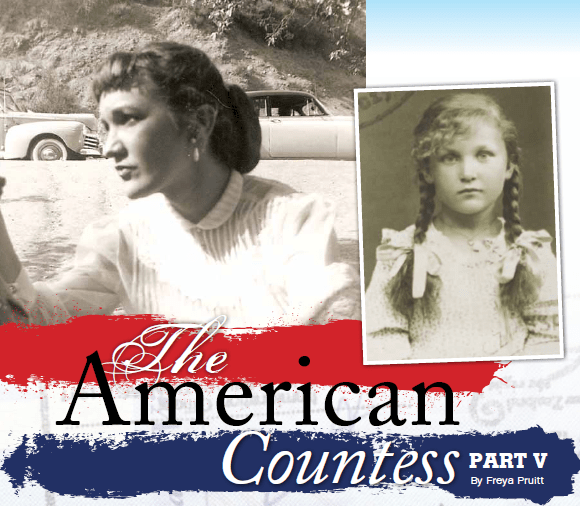 Luba Tcheresky: The American Countess. For those following this fascinating story, we have witnessed an eight-year old little girl travel from Russia to America- on a ship by herselfwith only a tag around her tiny neck. We have seen, through the eyes of a scared child, the enormous Statue of Liberty stretching her torch into the gray skies of the sea. Was she speaking to her- was she welcoming this small child into NY Harbor? As hundreds of immigrants ran to the side of the ship to see America for the first time, this little girl stood shivering alone. As the immigrants cried with gratefulness and hugged one another, the little Russian girl froze; she became strangely numb- and numb was how she would spend most of her life. But why was she sosad? This was America! The land of opportunity- the land where dreams came true! As she stood at the edge of the great ship, she had no idea where she was- or most importantly- WHO she was! As this small child entered Ellis Island, she entered as a cold and terrified child who spoke no English- who knew no one- who was to meet the mother who had left her in Russia as an infant. In this day of high-tech security, it is impossible to imagine the state of mind and spirit of this young girl. We as Americans in the year 2011, would be horrified to consider having our children travel across the ocean alone. But- this was the fate of this young girl- this was the journey she was supposed to be on. She had a destiny to discover and fulfill. She may have entered Ellis Island as an immigrant, but she discovered much later in her life- she was a Russian Countess- a descendant of the Romanov Dynasty. This discovery is even more dramatic than the facts themselves- as she went on to become a famous opera singer- without being aware of or using her Russian nobility status. Luba Tcheresky- was really Luba Lebedev: Countess Luba Lebedev- descendant of the Romanov Dynasty.